What better way to kick off this lovely weblog than to make up a fake award?! When we take the time to look around, we see a nice group of Catholic Hipsters leading the way in Catholic media these days. From EWTN, to local Catholic radio, to Twitter, Catholic Hipsters are all over the place. Let's be sure to celebrate them, before they become too mainstream. Bio: Host of Son Rise Morning Show, author of many books (including Prayer in the Digital Age), Catholic since 2005, and a proud resident of Cincinnati, OH. Catholic Hipster credentials: Swaim practically turned the Son Rise Morning Show into a must-listen event for us Catholic Hipsters...perpetually making it a right and just reason for my being late to work (until Immactulate Heart Radio sadly dropped it). He routinely pulls out awesomely obscure prayers to start the show, thrills us with spot-on references to The Princess Bride, and keeps it fresh and interesting for those of us in our early thirties. Just check out his Twitter feed if you feel I haven't made my case. His tweets range from Star Wars pez dispenser photos, to proof that he not only has Tears for Fears on vinyl, but also a BXVI nutcracker, and a God-given talent for starting hilarious hashtags. Bio: Senior apologist at Catholic Answers, often heard helping to make explaining and defending the faith extremely interesting and fun at the same time. Author of an amazing catalog of books, including The Fathers Know Best, Mass Confusion, The Salvation Controversy, and so much more. Catholic since 1992. Catholic Hipster credentials: When Jimmy Akin is the guest on Catholic Answers, he and host Patrick Coffin routinely turn the show into the most enjoyable hour on the radio. They make the whole thing feel like a giant inside joke that we're all in on. Akin is a serious fan of Doctor Who, which almost gives him the award straight away, in my book. He's a pro at helping to clear up misconceptions regarding what Pope Francis actually said, he's amazing as tossing out some solid low-carb recipes, and I haven't even mentioned the beard. The beard! Bio: Speaker, author, and former model on America's Next Top Model. She has a reversion story that will inspire young and old alike, and she is giving the culture the exact message it needs to hear. 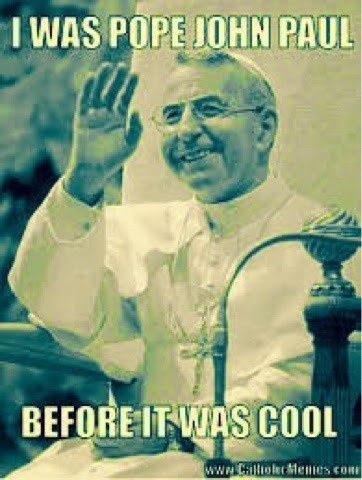 Catholic Hipster credentials: Just look at the glasses! Like Matt Swaim, her Twitter feed is full of Catholic Hipster perfection. From proclaiming Our Lady of Guadalupe as the world's first selfie, to retweeting the likes of Lecrae and Zach Braff, to hating Nutella before it was cool, Leah is leading the charge for our generation as she works to help us reclaim truth, beauty, and love. And let's not forget her epic tag line, "From Top Model, to Role Model." Matt Fradd (he once tweeted about having a copy of Green Lantern and a copy of the Summa Theologica by his side to get him through a long flight). Sr. Helena Burns (despite her hatred of the Vancouver Canucks, she is the ultimate habited Catholic Hipster. I'm not sure what my Twitter feed would be without her). So, what say you, beloved readers of The Essential Catholic Hipster Survival Guide? Leave your vote in the comments section or drop your vote on Twitter with the hashtag #Wojtys. 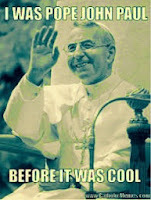 Let your Catholic Hipster voice be heard!